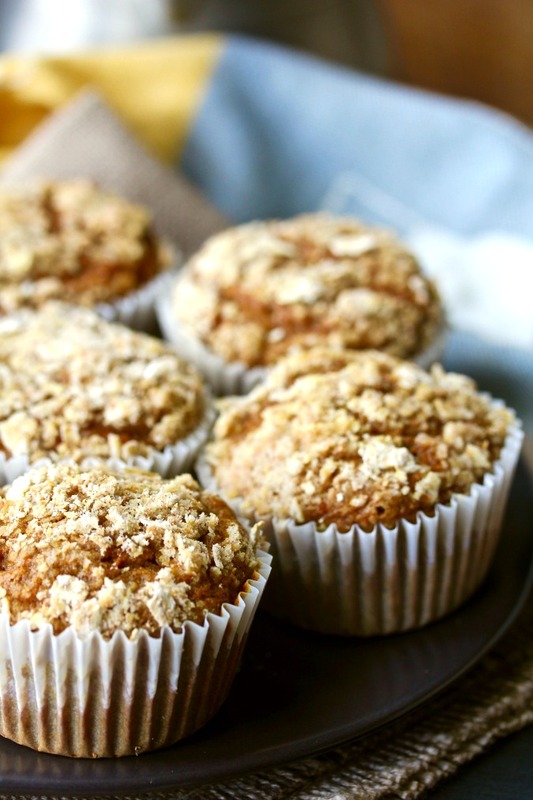 These Butternut Squash and Apple Muffins are wholesome and not overly sweet. They are made with whole wheat flour and sweetened mostly with fruit. Perfect for lunch boxes! These butternut squash and apple muffins have a surprisingly faint smoky flavor from the roasted butternut squash. They are also super moist from the apples and applesauce in the batter. 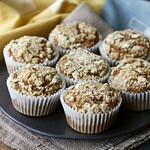 I topped these muffins with the same streusel that I made for these Bouchon Bakery Style Carrot Muffins. I made a full recipe of the streusel (enough for four batches of muffins), and have a zip lock bag of it in the freezer. It's actually pretty awesome to pull out some streusel from the freezer and spoon it over freshly mixed muffins before baking. I'm always learning. This recipe calls for whole wheat pastry flour. If you can't find it in your local grocery, you can use whole wheat flour. I'm pretty sure the results will be just fine. 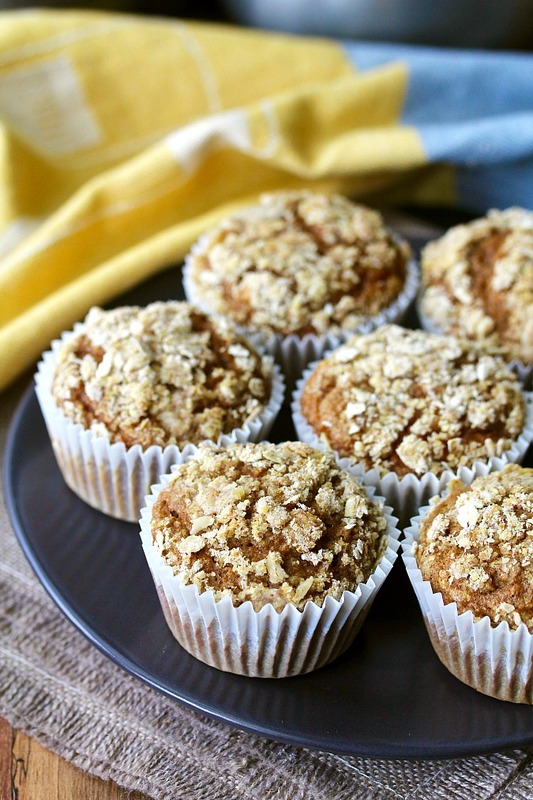 These butternut squash and apple muffins are soft, moist, and delicious. I presented them as butternut squash muffins to my family, and they pretty much turned up their noses at them. Then I presented them as apple cinnamon muffins. They tried them and loved them. So... there you go. My years in sales have not been wasted. My cousin gave me a very large butternut squash from her garden. I roasted the squash, pureed it, and made this Coconut Butternut Squash soup with half of it. I put the rest of the puree in the freezer to make these muffins later. I'm pretty sure home grown butternut squash is the winter version of zucchini. Everyone has way more than they can use. That's why I love that you can freeze the roasted puree. 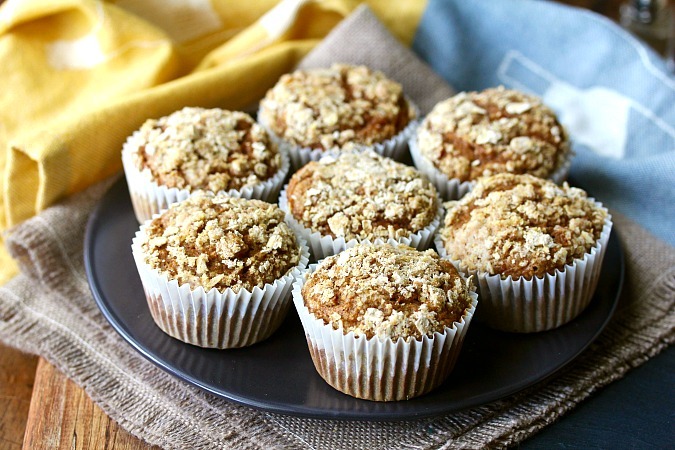 These muffins can be made sweeter by upping the amount of brown sugar in the recipe. You can increase it up to 3/4 cup for a sweeter muffin. You can also reduce the sugar by about 2 tablespoons for a less sweet muffin. 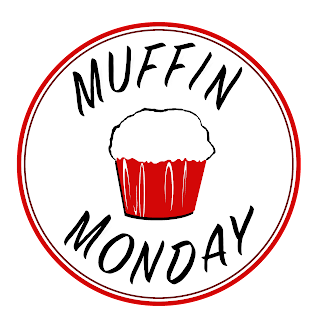 After the recipe, be sure to check out the rest of the #MuffinMonday muffins. Preheat the oven to 350 degrees F and line two muffin pans with 18 paper liners. In a large bowl, mix the squash, eggs, brown sugar, apple sauce, and vegetable oil. In a medium bowl, whisk together the flour, salt, baking soda, baking powder, and cinnamon. Add the dry ingredients to the wet ingredients, and mix with a rubber spatula until just blended. Fold in the chopped apples. Fill each muffin cup about 2/3 full. Top each with about a tablespoon of streusel. Lightly pat the streusel on top of the batter. Bake the muffins, one pan at a time, for 15 to 20 minutes. A toothpick should come out clean. Let the muffins cool in the muffin pan for about 5 minutes, and then continue cooling on a wire rack. You are so smart, Karen! 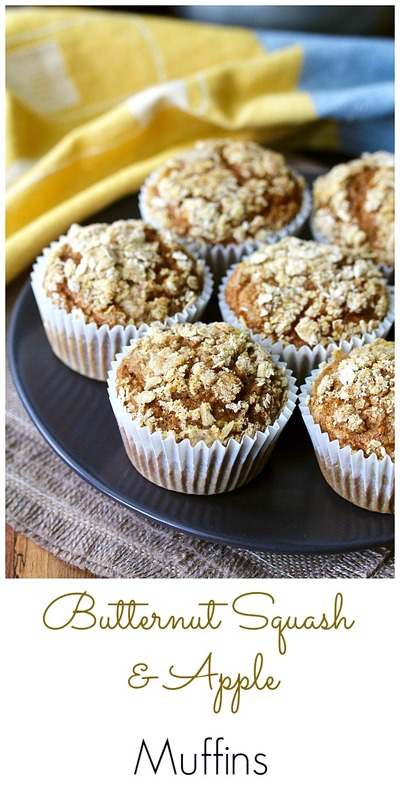 Frozen streusel and frozen roasted butternut squash means you can have these ready in a jiffy. Which to me is the whole point of muffins! It was nice to be able to pat myself on the back for being so prepared for once, ha ha! I love the idea of freezing streusel to have on hand....genius Karen. Thanks! It kind of happened by accident when I didn't realize the recipe I was following was for four batches, but now I'm glad I did! Thank you! 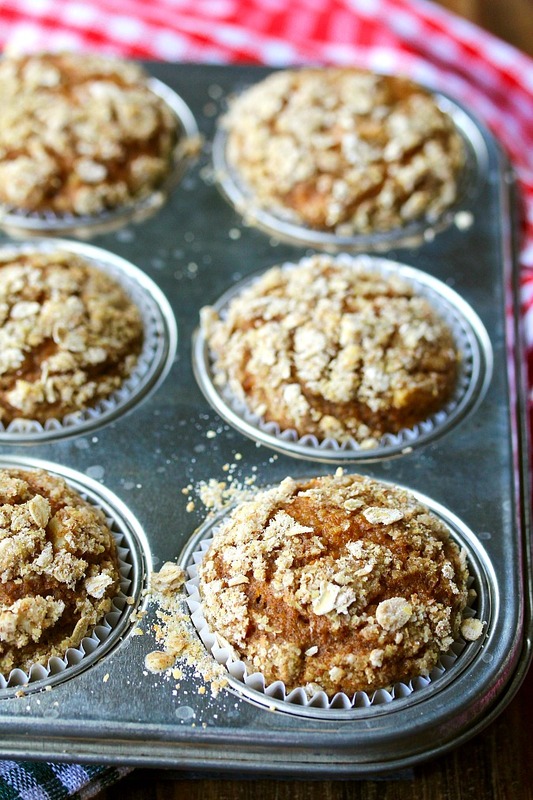 Streusel is a big deal here on muffins!